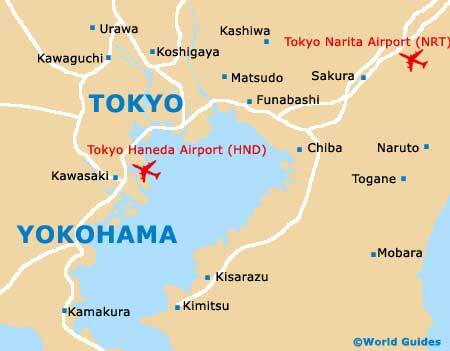 Japan's second-biggest city, Yokohama resides in the Kanto region of Honshu and is just a short distance south of Tokyo. 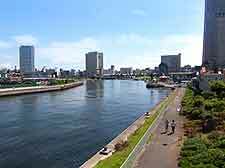 Yokohama has long been the capital city of the Kanagawa Prefecture and is considered part of the sprawling Greater Tokyo area. Once a maritime town and standing on Japan's eastern coast, Yokohama has grown into a thriving port city and is filled with its own unique character and tourist appeal. Yokohama makes a pleasant contrast to the somewhat more hectic lifestyle in nearby Tokyo and is full of interest, with highlights including the restaurants around its buzzing Chinatown district, and the particularly tourist friendly seafront development known as Minato Mirai 21. For the latest tourism advice, a visit to the Landmark Tower and its free access to the Internet is in order. Alternatively the Minato Mirai 21 Tourist Information Centre is worth finding, close to the northern side of Sakuragi-cho Station, where the free 'Yokohama City Guide' booklet is available. With information about the main tourist districts and notable neighbourhoods, this tourist guide to Yokohama can prove invaluable. Without doubt a tourist friendly city full of top tourist attractions, a trip to Yokohama is one to savour. When visiting Yokohama, look out for the dramatic modern complex of Minato Mirai 21, the stunning views from the Yokohama Sky Walk, the many exotic animals at Nogeyama Zoo, the underwater creatures at Sea Paradise, the many fast rides and huge Ferris wheel at Yokohama Cosmo World, and the enormous Yokohama Stadium, the city's baseball stadium, which boasts seating for around 30,000 spectators. Within Yokohama you will be surprised at both the quantity and quality of parks and gardens, famous for their springtime cherry blossoms. Sankei-en Garden is amongst the highlights and features many classical Japanese features, while the gardens of Grand Mall Park surround the modern Minato Mirai 21 complex and soften the strong lines. Yokohama's Kodomo-no-Kuni Park and Zoo offers plenty of tourist attractions for all the family, while Yokohama Park stands next to the city's baseball stadium and regularly hosts many large outdoor events. 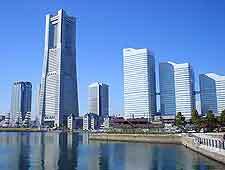 More information about Yokohama Tourist Attractions. The city of Yokohama offers an array of imposing landmarks, both old and new. 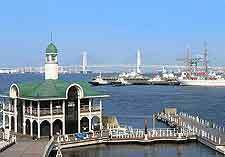 The most eye-catching include the instantly recognisable Yokohama Bay Bridge and its suspension structure, the late 19th-century Osanbashi Pier, the restored dockland Red Brick Warehouse, the WWII Hikawa-Maru Ship, and the tallest building in the whole of Japan, Landmark Tower, boasting superb views of the Yokohama cityscape. More information about Yokohama Landmarks. Yokohama is home to a good selection of museums, and whilst there may be more in nearby Tokyo, the city's offerings are more than enough for most tourists. Highlights include the recreations of historic street scenes at the China Museum, the celebration of the local silk industry at the Silk Museum, the 10,000+ dolls at the unusual Yokohama Doll Museum, the historic information about the city's harbour at the Yokohama Maritime Museum, and the wealth of paintings at the Yokohama Museum of Art, where famous artists include both Picasso and Cezanne. More information about Yokohama Museums and Yokohama Art Galleries. Near to Yokohama, tourists wishing to venture outside of the city boundaries will find plenty of suitable day trips to add to their itinerary. The cosmopolitan city of Tokyo is especially notable and with a population of over 12 million, Tokyo is a truly diverse city, with everything ranging from a huge number of shrines and temples, to futuristic skyscrapers and glitzy buildings. Also worth a visit and close to Yokohama, consider a visit to Kamakura and its innumerable temples and huge Amida Buddha statue, the authentic Japanese farmhouses within the city of Kawasaki, and also the many gems within Yamato's noteworthy Nara Prefecture Kashihara Archaeological Museum. 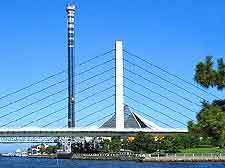 More information about Yokohama Attractions Nearby.